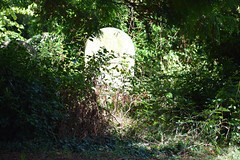 Stowmarket Old Cemetery opened in 1855, after an Act of Parliament put an end to burials in urban churchyards. 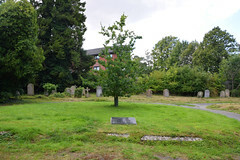 It is a small cemetery, set out on the road towards Bury. 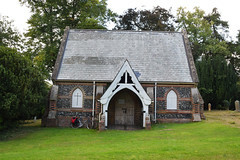 The two chapels, one Anglican and the other non-conformist, are almost entirely identical. 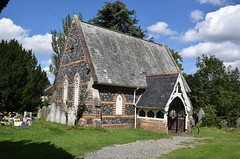 They are in a typical red brick and dressed stone Early English style, and the architect was E G Pennington. 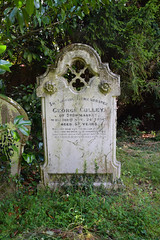 Pevsner thought it worth noting that they are not symmetrically placed, which is certainly unusual. 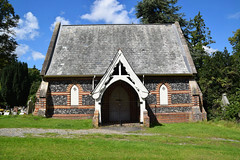 In many cemeteries later in the century the paired chapels would share a porte-cochère as at Ely, and even in the 1850s it was usual to place them in a juxtaposition to each other, as at Ipswich. 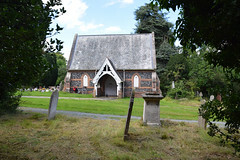 Here, however, the two chapels are simply not talking to each other. 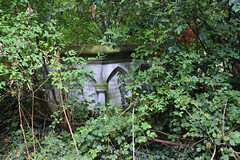 Although they are set either side of the main path through the cemetery, one is down by the road to Bury and the other is set back among the trees further up. 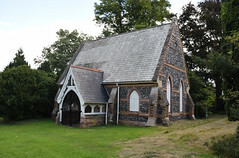 I assume that the one closer to the main road, being more prominently placed, was the Anglican chapel. 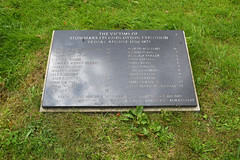 On Friday, 11th August 1871, a massive explosion tore through a guncotton factory in the centre of Stowmarket. 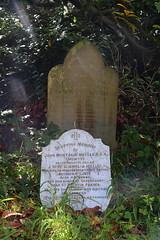 Twenty-eight people were killed, and twenty-three of them were buried in a mass grave in the cemetery. 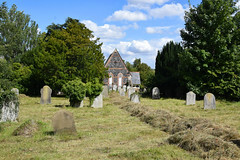 The cemetery soon proved too small for the town, which expanded rapidly in the second half of the century, and it closed for burials in 1901 to be replaced by a much larger new cemetery across the road. 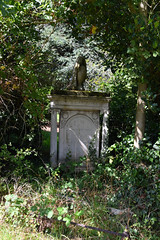 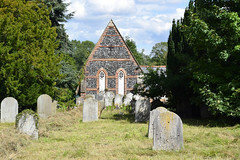 After many years of abandonment, the Old Cemetery was taken over by Stowmarket Town Council in 2007 and is maintained as a wildlife area. 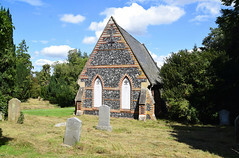 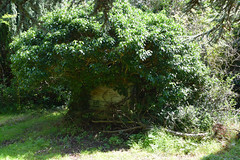 The two surviving cemetery chapels are no longer in use. 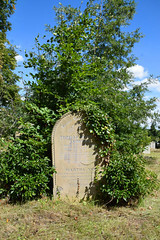 In 2013, a memorial to the twenty-eight victims of the 1871 explosion was unveiled in the Old Cemetery. 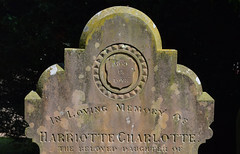 Curiously, it only bears the names of the twenty-three people who were buried in the mass grave in the cemetery, and not the names of the five buried elsewhere.